Keal Carlile breaks through during Sheffield Eagles v Whitehaven at Bawtry Road in Sheffield, United Kingdom, 12 March 2016. Photo by Glenn Ashley. 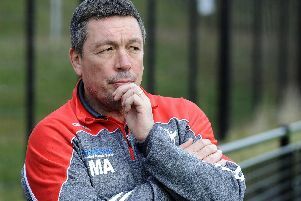 Sheffield Eagles have to make Bawtry Road a fortress if they are to gatecrash the Kingstone Press Championship top four. That is the believe of director of rugby Mark Aston. The Eagles are set for their third consecutive home game this Saturday when they take on Workington Town at Sheffield Hallam University Sports Park. Since moving back into Sheffield, the Eagles have had a mixed bag of results which has seen them topple the likes of Halifax but slip up against lowly Whitehaven. Aston has admitted that his side are still getting accustomed to their current surroundings, but says his side have had enough time to settle back into the city, and he now expects results to start improving their performances on home soil. “Firstly, it is nice to be back at home again this weekend, and more importantly it is nice to be back in Sheffield on a permanent basis” Aston said. “I would like to think if we can get some continuity at home it will bring some consistency in our overall results. The Eagles turned the corner last time out to record a last gasp victory over Dewsbury Rams, before enjoying a break in the calendar for round six of the Challenge Cup. Aston has admitted that his side have failed to adapt to the Bawtry Road environment so far, but he is confident that with the improvement in conditions his side will soon take to their temporary surroundings. “We don’t train there all the time like we used to, we train at Sheffield University, that has been a factor,” he added. “The weather is starting to clear up now, that will help us. The home games keep coming for Aston’s side with a fixture against Bradford Bulls to follow against Workington. The match with Town this Saturday is a 3pm kick off.